Erin could be considered one of the hardest working women on the MTB pro cycling circuit. Literally. Besides racing a pretty full race schedule, Erin is a mechanical engineer with a full time job as a project manager for a medical device company. Many of her co-workers don't even know she races and those who do, don't really grasp the concept of the level at which she's riding. They probably don't know she was the US Elite XC and STXC National champion in 2016 and repeated being the US Elite STXC National champion in both 2017 and 2018. She should have wore her stars and stripes to work. And she could have. 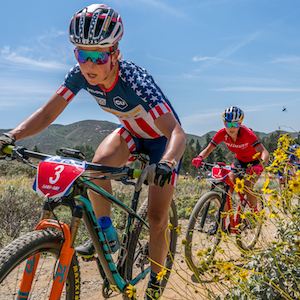 After the 2017 US National Championship, Erin's biggest focus: getting her bike packed and prepping for a 10 am meeting she had the next morning back home. Most of her vacation time is devoted to flying around the country and the world to compete in races and World Cup events. It's almost like Erin is a superhero with a secret identity. Unlike superheroes though, Erin wasn't given her superpower, she works for it, day in and day out. Through broken fingers, broken hands, long layovers, delayed flights, after work intervals, and early morning meeting, Erin has committed herself to her goal of racing at the highest international level and considers herself very lucky to be able to do so.